While Sproles (hamstring) will not play this week and has not taken the field since Week 1, head coach Doug Pederson said Friday that he will play at some point this season, according to Zach Berman of The Philadelphia Inquirer. Analysis: Sproles' recovery has been a slow one, but it appears the Eagles are content to let the process play out and not place him on injured reserve. A target date for Sproles' return remains uncertain, but he will get a free week to rest and recover with the Eagles on bye in Week 9. 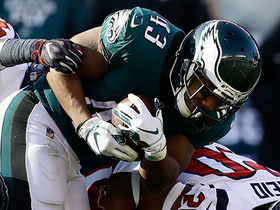 The Eagles ruled Sproles (hamstring) out for Sunday's game against the Jaguars in London. Analysis: After Sproles failed to practice either Wednesday or Thursday, it was evident he wouldn't be ready to rejoin the backfield mix this weekend. While the team heads overseas, Sproles will remain in Philadelphia to continue rehabbing on his own through the Week 9 bye. Sproles is presumably eyeing the Eagles' Nov. 11 matchup with the Cowboys for a return to game action for the first time since the season opener. Sproles (hamstring) isn't participating in Thursday's practice, Dave Zangaro of NBC Sports Philadelphia reports. Analysis: Sproles hasn't dressed for a game since the season opener due to the hamstring injury and that seems unlikely to change Week 8 against the Jaguars in London. The Eagles will head into a bye after this weekend's contest, so Sproles is presumably setting his sights on returning to action Nov. 11 against the Cowboys. Sproles (hamstring) isn't practicing Wednesday, Zach Berman of The Philadelphia Inquirer reports. Analysis: Coach Doug Pederson said he expected Sproles to resume practicing this week, but it apparently won't happen Wednesday. The 35-year-old scatback hasn't played since Week 1 and doesn't seem likely to return for Sunday's game against the Jaguars. Sproles (hamstring) won't play Sunday against the Panthers, Mike Kaye of NJ.com reports. Analysis: Sproles still hasn't been able to practice fully since Week 1, but coach Doug Pederson is optimistic it will happen next week. Corey Clement and Wendell Smallwood will split snaps in the Philadelphia backfield during Sunday's game. Sproles (hamstring) is unlikely to play Sunday against the Panthers, but coach Doug Pederson is "optimistic" the running back will be able to practice next week, Zack Rosenblatt of NJ.com reports. Analysis: Sproles hasn't played since Week 1, nor has he practiced since Week 2 because of the injury. 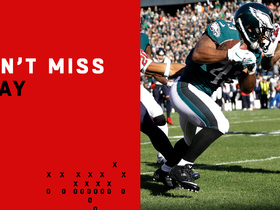 His official status for Week 7 will be revealed at some point Friday, but as things currently stand, fantasy players should plan on Sproles being unavailable for yet another game. Sproles (hamstring) wasn't spotted at practice Thursday, Zack Rosenblatt of NJ.com reports. Analysis: Though coach Doug Pederson labeled Sproles as day-to-day earlier in the week, there's no indication that the running back is closing in on a return to game action after failing to practice Wednesday and Thursday. It's looking likely that Sproles will miss his sixth straight contest Sunday against the Panthers, allowing Corey Clement and Wendell Smallwood to handle elevated snap counts as the Eagles' preferred options out of the backfield. Sproles (hamstring) didn't practice Wednesday, Dave Zangaro of NBC Sports Philadelphia reports. Analysis: Coach Doug Pederson referred to Sproles as day-to-day prior to Wednesday's session, but the running back still hasn't demonstrated any clear sign of progress. The 35-year-old hasn't played or practiced since Week 1 and now seems like a long shot to be available for Sunday's game against Carolina. Coach Doug Pederson said Sproles (hamstring) remains day-to-day and wouldn't reveal whether the running back would practice Wednesday, Jeff McLane of The Philadelphia Inquirer reports. Sproles (hamstring) has been ruled out for Thursday's game versus the Giants. 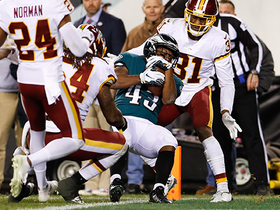 Analysis: Earlier Wednesday, coach Doug Pederson told Graham Foley of the Eagles' official site that Sproles is "close" to making a return to game action, but such sentiments were belied by the 35-year-old's lack of practice reps this week. Sproles thus won't be involved in the first version of the Eagles backfield without Jay Ajayi (knee), who suffered a season-ending ACL tear in Week 5. Corey Clement and Wendell Smallwood will be the initial beneficiaries of Ajayi's absence. Coach Doug Pederson said Wednesday that Sproles is "close" to returning, but it remains unlikely that the running back will be available Thursday against the Giants, Graham Foley of the Eagles' official site reports. Sproles (hamstring) wasn't in attendance for the start of Tuesday's practice, Zack Rosenblatt of NJ.com reports. Analysis: The Eagles listed Sproles as a non-participant on their estimated injury report Monday and it looks like he'll remain out of the mix for the team's first official session of the week. The short turnaround between games makes it unlikely that Sproles will be available Thursday against the Giants, which would extend his streak of absences to five consecutive games. Sproles' availability for future contests will be shrouded in doubt until he returns to full practice. Sproles (hamstring) was listed as a non-participant on the Eagles' estimated injury report Monday, Zach Berman of The Philadelphia Inquirer reports. Sproles (hamstring) has been ruled out for Sunday's game against the Vikings, Martin Frank of The Delaware News Journal reports. Analysis: Sproles still hasn't returned to practice and will now miss a fourth consecutive game. With Corey Clement (quad) also in danger of sitting out, Wendell Smallwood may be the top backfield option on passing downs. Sproles (hamstring) wasn't present for the start of Friday's practice, Zack Rosenblatt of NJ.com reports. 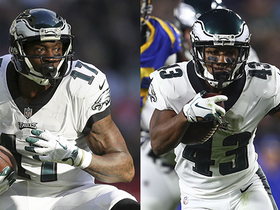 Analysis: Coach Doug Pederson expected both Sproles and Corey Clement (quad) to practice Friday in some capacity, but neither running back was on the field for the beginning of the team's session. The Eagles seem to be headed for another week with Wendell Smallwood serving as the No. 2 option behind starter Jay Ajayi. Sproles (hamstring) will practice Friday and the Eagles will make a call on his Week 5 status after the session, Zack Rosenblatt of NJ.com reports. Analysis: Sproles sat out practice Wednesday and Thursday, so even his return to practice on a limited basis Friday would amount to a step in the right direction. Since the 35-year-old has already missed three games and is just getting back to practice, it seems unlikely he'll gain clearance to play Sunday against the Vikings. Philadelphia will make a similar determination on the status of Corey Clement (quadriceps) after Friday's practice. Sproles (hamstring) was listed as a non-participant in Thursday's practice. Analysis: With Sproles still not practicing on even a limited basis, he appears destined to sit out his fourth straight game Sunday against the Vikings. Corey Clement (quadriceps) was also a non-participant in practice for the second straight day, potentially setting Wendell Smallwood for another healthy snap count behind top back Jay Ajayi. Sproles (hamstring) didn't practice Wednesday, Zack Rosenblatt of NJ.com reports. Analysis: Coach Doug Pederson referred to Sproles as day-to-day earlier Wednesday, perhaps hinting at a return to practice later this week. The pint-sized running back has missed the past three games, allowing Wendell Smallwood to take on a meaningful role in the offense. The Eagles host the Vikings on Sunday. Coach Doug Pederson said Wednesday that Sproles (hamstring) remains day-to-day ahead of the Eagles' Week 5 matchup with the Vikings, Mike Kaye of NJ.com reports. Analysis: It's unclear if the hamstring issue will render Sproles a non-participant in the Eagles' first practice of the week later Wednesday, but the lack of status change isn't the most encouraging sign for the running back's prospects. Sproles has missed the Eagles' last three games with the injury and may need to put in a full practice by Friday to have a realistic shot at suiting up Sunday against the Vikings. Sproles (hamstring) has been ruled out for Sunday's game in Tennessee, Daniel Gallen of PennLive.com reports. Analysis: Sproles will sit out for a third straight week, while Jay Ajayi is expected to play through a small back fracture after missing just one game. Corey Clement (quad) likely will handle passing downs, assuming he's able to play through his own injury. Sproles (hamstring) was not seen at practice Friday morning, Les Bowen of the Philadelphia Daily News reports. Analysis: Sproles seems likely to sit out practice for the third consecutive day with the hamstring injury he's been dealing with since the season opener. The 35-year-old's official designation for Sunday's game at Tennessee should come out later Friday, but he seems to be trending toward missing his third straight game. Jay Ajayi continues to battle through a back injury, but has a more optimistic outlook. Sproles (hamstring) wasn't present at Thursday's practice, Tim McManus of ESPN.com reports. Analysis: Sproles made an appearance without a helmet during Wednesday's session but was ultimately listed as a non-participant on the injury report. He seems destined for such a tag Thursday, but on a positive note for the Eagles backfield, Jay Ajayi practiced for the first time since injuring his back Week 2. Sproles (hamstring) was listed on the injury report as a non-participant at Wednesday's practice, Jeff McLane of The Philadelphia Inquirer reports. Analysis: Sproles was spotted stretching with his teammates, but he apparently didn't do much else during Wednesday's session. He's been listed as a non-participant for every practice since Sept. 12, missing the past two games and now seemingly in danger of sitting out a third. With Jay Ajayi (back) also held out of practice Wednesday, the Eagles may need to lean on Corey Clement, Wendell Smallwood and Josh Adams during Sunday's game in Tennessee. Sproles (hamstring) returned to a limited practice Wednesday, taking the field without a helmet, Tim McManus of ESPN.com reports. Analysis: Sproles joined his teammates on the practice field for the first time since Sept. 12, taking a big step forward in his quest to avoid any additional missed time. A full practice Thursday and/or Friday would inspire confidence with regards to his availability for Sunday's game in Tennessee. Coach Doug Pederson was optimistic when he discussed Sproles and Jay Ajayi (back) on Monday, but it's still unclear if either running back will be available for Week 4. Coach Doug Pederson expects Sproles (hamstring) and Jay Ajayi (back) to return for Sunday's game in Tennessee, Tim McManus of ESPN.com reports. 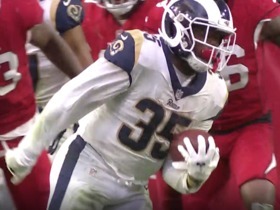 Analysis: Corey Clement and Wendell Smallwood held down the fort in Sunday's 20-16 win over Indianapolis, combining for 166 scrimmage yards and a touchdown. The Eagles are optimistic Sproles won't miss a third consecutive game, but we may not have a real idea until Wednesday when the team releases its first injury report of the week. Sproles and Ajayi were non-participants in practice all last week, eventually getting ruled out Friday. Sproles (hamstring) has been ruled out for Sunday's game against the Colts, Zack Rosenblatt of NJ.com reports. Analysis: The Eagles are awfully banged up in the backfield, as Jay Ajayi (back) has also been ruled out and Corey Clement (quad) is listed as questionable. Wendell Smallwood and Josh Adams are the only healthy running backs on the roster, though Clement's injury may not be serious. Sproles (hamstring) was not spotted at Friday's practice, Martin Frank of The Delaware News Journal reports. Analysis: The same goes for Jay Ajayi (back), which sets the stage for Corey Clement to lead the Eagles' backfield Week 3 in the event that both end up ruled out later Friday. The Eagles will decide whether or not Sproles (hamstring) will play Week 3 at some point Friday, Eliot Shorr-Parks of Sports Radio 94 WIP Philadelphia reports. Analysis: Sproles has not practiced yet this week, which means he will likely have to get in at least some work Friday in order to return to action Sunday against the Colts. Sproles' status will be updated again after the Eagles release their final injury report of the week. Sproles (hamstring) didn't practice Thursday, Jeff McLane of The Philadelphia Inquirer reports. Analysis: As coach Doug Pederson told Zack Rosenblatt of NJ.com, Sproles is expected to be sidelined "a little bit longer" than fellow non-practice participant Jay Ajayi (back). With the duo embedded in rehab so far this week, the Eagles are preparing Corey Clement to lead the backfield and Wendell Smallwood to take on lingering touches. Sproles (hamstring) wasn't present for the portion of Thursday's practice that was available to the media, Dave Zangaro of NBC Sports Philadelphia reports. Sproles (hamstring) didn't practice Wednesday, Jimmy Kempski of PhillyVoice.com reports. Eagles head coach Doug Pederson said Wednesday that Sproles (hamstring) will be sidelined "a little bit longer" than Jay Ajayi (back), Zack Rosenblatt of NJ.com reports. Sproles (hamstring) has been ruled out for Sunday's game in Tampa Bay, Mike Garafolo of NFL Network reports. Analysis: A limited practice participant to start the week, Sproles was held out entirely Thursday and Friday. Jay Ajayi and Corey Clement are both candidates to take on some of the vacated snaps, with the latter a better bet to replace Sproles in clear passing situations. 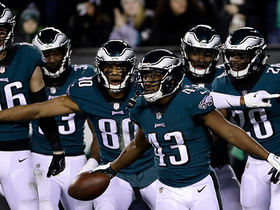 Clement handled the passing-down role during Philadelphia's playoff run last season, highlighted by a 4-100-1 receiving line in the Super Bowl. Sproles' (hamstring) availability for Sunday's game against at Tampa Bay will be determined following Friday's practice, Zack Rosenblatt of NJ.com reports. Analysis: Coach Doug Pederson said Sproles is dealing with a "slight hamstring issue," which had him sitting out Thursday's practice session. Corey Clement would see an increased workload behind Jay Ajayi if Sproles is unable to suit up for Week 2. Sproles (hamstring) didn't practice Thursday, Adam Caplan of SiriusXM Radio reports. Analysis: After turning in a limited showing at Wednesday's session, Sproles spent Thursday solely as a member of the rehab group. Coach Doug Pederson has yet to comment on the health of the veteran running back, meaning Sproles' Week 2 availability may not be known until the Eagles release their last injury report Friday. If he's absent Sunday at Tampa Bay, Jay Ajayi and Corey Clement would form a 1-2 punch out of the backfield. Sproles (hamstring) wasn't spotted on the field prior to Thursday's practice, Martin Frank of The Delaware News Journal reports. Analysis: The Eagles listed Sproles as a limited participant at Wednesday's session due to the hamstring issue and it doesn't appear he'll shed the injury designation when the team releases Thursday's practice report. It's unclear if Sproles' absence is merely for maintenance purposes or if he experienced a setback during his activities Wednesday, but a final word on his outlook for the Week 2 matchup with the Buccaneers should come Friday. Sproles was a limited practice participant Wednesday due to a hamstring injury, Adam Caplan of SiriusXM Radio reports. 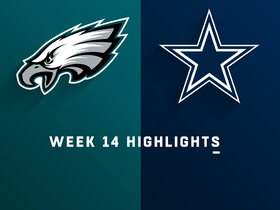 Sproles rushed five times for 10 yards and caught four of his seven targets for 22 yards in Thursday's 18-12 victory over Atlanta. Analysis: The veteran saw a heavy workload in his first game back from a torn ACL but failed to do much with it as he shakes off the rust. The extended absence and sitting out all of the Eagles' preseason games didn't scare the team away from calling plays for the 35-year-old, as his nine touches were second among the team's running backs, firmly between Jay Ajayi and Corey Clement. Sproles seems ticketed for a similar role all season, continuing with Tampa Bay at home Week 2. Sproles won't play in Thursday's preseason game against Cleveland, Daniel Gallen of PennLive.com's reports. 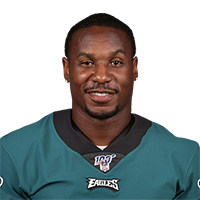 Sproles won't play in Thursday's preseason game at New England, Derrick Gunn of NBC Sports Philadelphia reports. Analysis: Sproles is logging his second DNP in as many exhibitions, a trend that may continue until the regular season. Still, it would behoove the Eagles to see if the 35-year-old resembles the form evident prior to last season's ACL tear. Once Week 1 arrives, he likely will slot in behind Jay Ajayi and Corey Clement (undisclosed) in the running back pecking order, but Sproles' pass-catching chops should keep him in the team's game plan from week to week. 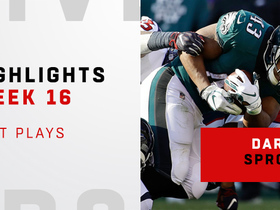 Sproles, who suffered a torn ACL and a broken wrist in the Week 3 last season, is looking good early on in training camp, the Eagles' official site reports. Analysis: With Jay Ajayi and Corey Clement slated to handle the bulk of the team's early-down work, Sproles is in line to reprise his pass-catching role in the Eagles' backfield. 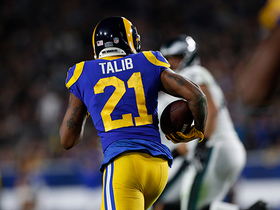 The 35-year-old should thus carve out a degree of PPR-utility, but only in deeper formats, as he's unlikely to earn the sort of volume that he did during his prime years. Sproles (knee, arm) stated Sunday that 2018 would be his final season, per his official Twitter account. Sproles (knee, arm) is in consideration for kickoff return duties, Zach Berman of the Philadelphia Inquirer reports. Sproles (knee, arm) wasn't present for the start of OTAs on Tuesday, Dave Zangaro of NBC Sports Philadelphia reports. 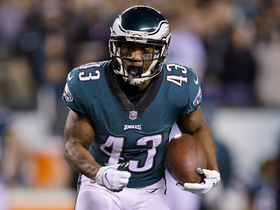 Analysis: Sproles suffered a fractured right arm and a torn ACL in his left knee last September and is likely still working through the latter stages of his rehab. The fact that the Eagles still re-signed him this offseason despite the injuries means he should be slated to make a full recovery at some point prior to, or during the upcoming campaign. An exact timetable for that return is still somewhat uncertain, however, so look for additional updates to be provided as training camp closes in. Sproles (knee, arm) has agreed to terms on a new contract with the Eagles, Ian Rapoport of the NFL Network reports. Analysis: As expected, Sproles will return for the chance at another Super Bowl run with the defending champion Eagles. While he'll clearly slot in behind Jay Ajayi and Corey Clement on early downs, Sproles remains a useful gadget player who should keep his role as the team's primary return man on both punts and kickoffs. It isn't clear where he stands in his recovery from a torn ACL, but Philadelphia's new commitment to him suggests Sproles is expected to make a full recovery. Sproles (knee, arm), an unrestricted free agent, seems likely to re-sign with the Eagles, Dave Zangaro of NBC Sports Philadelphia reports. Analysis: While he wouldn't get many carries behind Jay Ajayi and Corey Clement, the 34-year-old could still be useful on special teams and passing downs if he makes a full recovery from the torn ACL and broken arm he suffered in Week 3 last season. Sproles resumed running in January and is leaning toward trying to play for at least one more year. The Eagles want him back, but they presumably expect him to settle for a salary far smaller than what he's grown accustomed to. Sproles (knee) said Monday that he's leaning toward returning for a 13th NFL season in 2018, Ian Rapoport of NFL Network reports. Analysis: Sproles' season ended in late September against the Giants, when he fractured his arm and tore his ACL. While the injury initially looked damaging to the Eagles' playoff hopes, the play of rookie Corey Clement and trade-deadline pickup Jay Ajayi out of the backfield more than compensated for Sproles' absence and helped guide the Eagles to Super Bowl LII. With Sproles heading into his age-35 season and coming off a major injury, he may find limited suitors for his services. Sproles (arm/knee) has started running, as of Wednesday, Sports Radio 94 WIP reports.